Rob and Deb Armitage are a husband and wife team of Sales Representatives with RE/MAX Preferred Realty in Windsor. As a team, they can offer their combined knowledge, experience, and real estate resources to their clients throughout Windsor and Essex County. Modern Brand and a Powerful, Customized Website. Their solution began with a new brand. 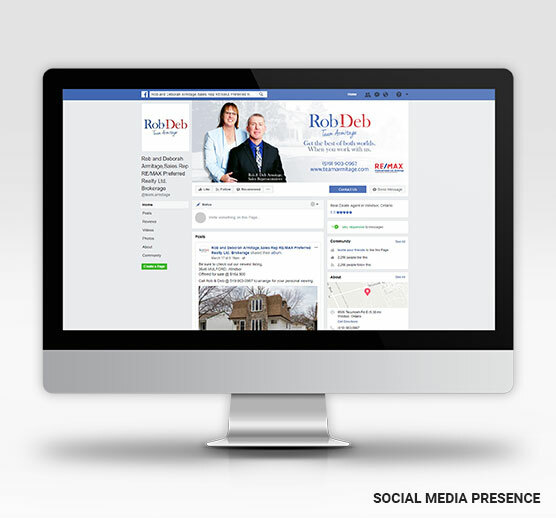 As a team, Rob and Deb needed a shared brand and a message that reflects both on them and their real estate expertise. 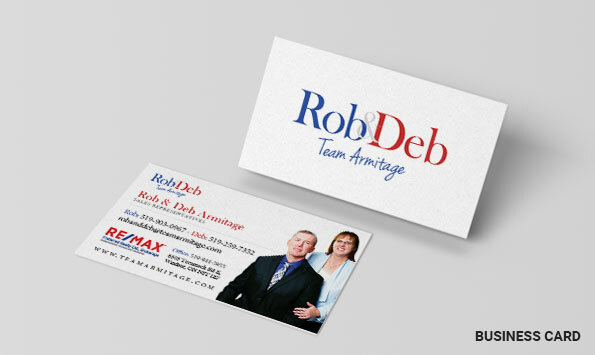 We created a team logo for Rob and Deb that includes both of their names as well as “Team Armitage” in it so clients would know they are getting the backing of a team of Sales Representatives and introduce Rob and Deb individually to give their brand a personal touch. With their new brand in place, we custom designed and developed a new Real Estate Solution website for Team Armitage. Their website presents Rob and Deb both and individuals and as a team to help build their brand, and includes custom sections and features to help further their message of client-focused real estate service when you’re ready to buy your next home, and using the latest technology to help you sell your home. Like all Real Estate Solution websites, Team Armitage’s website is fully responsive for desktop, tablet, and mobile devices, includes automated property listings, lead capture and management tools, a tailored back end system to manage their website more easily, and more. With their solution in place, we continue to work with Rob and Deb to meet their social media marketing and branding needs. We continue to advertise new properties, giveaways, and real estate information for Team Armitage on Facebook as well as on their website, and have handled their branding and print needs including business cards, yard signs, outdoor signage, and more. Team Armitage is just one of the many real estate teams that has turned to Real Estate Solution to help create a team brand, get a custom designed and developed team website, and to bolster their marketing efforts. Whether you are an individual, a part of a team, or interested in services for brokerages, Real Estate Solution has a wide range of services to help you generate more leads and grow your real estate business. Whether you are just starting out, a top producer or brokerage - we are here to help! For all your sales and general inquiries contact us in the form below. Have a support-related question? Please visit our support page. Our Knowledgable staff will do the work for you. Copyright © 2019 Real Estate Solution. The trademarks REALTOR®, REALTORS® and the REALTOR® logo are controlled by the National Association of REALTORS® (NAR) in the U.S., and The Canadian Real Estate Association (CREA) in Canada, and identify real estate professionals who are members of NAR in the U.S., and CREA in Canada. The trademarks MLS®, Multiple Listing Service® and the associated logos are owned by The Canadian Real Estate Association (CREA) and identify the quality of services provided by real estate professionals who are members of CREA. The trademark DDF® is owned by The Canadian Real Estate Association (CREA) and identifies CREA’s Data Distribution Facility (DDF®).